Date paste makes the perfect alternative to sugar in recipes. Add it to your oatmeal or smoothies. Use it in replace of sugar in nearly any baked cooked. Dates are a natural way to sweeten up your food since they are packed with natural sugars, fiber, vitamins, and minerals. Replace equal amounts of date paste with sugar in recipes. For example, if a recipe calls for 1 cup of sugar, use 1 cup of dates blended with ½ cup of water. Soak dates in warm water for ~30 minutes. 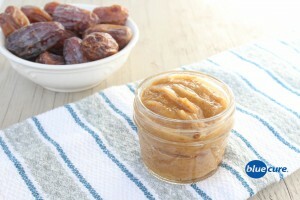 Blend the dates and the date water in a blender or a food processor until smooth. Use immediately or store in the fridge to use in smoothies, oatmeal, or recipes throughout the week.